Britain stands on the edge of war. A gentleman, whose hair is an amalgamation of different shades of grey, has the stage all to himself; all other performers being relegated to secondary roles. The role of protagonist in this drama of politics should not be a foreign one to the actor; he is the lesser son of a British political dynasty. Now, however, it is his turn to speak and to act, his opportunity to make history, to be history. He succeeds. His words and actions, so full of declarative statements and imbued with certainty, garner rapturous applause. The performance of Hilary Benn in the House of Commons on December 2nd 2015 was not, as John McDonnell suggests, reminiscent of Tony Blair. It was the fragments of the spectre of Neville Chamberlain which haunted Parliament as Hilary Benn stood at the dispatch box. Certain features of a much maligned former Prime Minister were, of course, missing. The moustache and the umbrella did not feature; Hilary Benn being clean shaven and the Houses of Parliament, for the time being at least, still having a fully functioning roof. Furthermore, whereas Benn made the case for war, or at least the extension of it, Chamberlain tried desperately to avert conflict. On top of this, Benn’s speech, due to widespread support for air strikes on the government benches, was a symbolic gesture and not the foundation of British policy in the manner in which Chamberlain’s actions were. All of that said however, Chamberlain’s return from Munich in the autumn of 1938 is, in essence, broadly similar to Benn’s speech. Both men were, and are, convinced of their absolute rightness when it comes to a foreign policy decision. The certainty exuded by Chamberlain upon gaining Hitler’s signature following the Munich Agreement, he is reported to have exclaimed “I’ve got it”, an act succeeded by the event which everyone remembers him for, in his Munich hotel room a few hours after receiving it, is matched by Benn’s belief that ‘we must confront this evil [ISIS]’ through the use of air strikes. In each case, both men appear to discard doubt: Chamberlain believed that Hitler would keep his word, thereby ensuring that Britain and Germany ‘would never go to war again’; likewise, Benn believes that air strikes are a ‘must’ in order to defeat the modern form of Fascism. On top of this, both men have used history in order to justify their actions. Chamberlain, through his ‘peace in our time’ quote, echoed Disraeli upon the reforming Prime Minister’s return from the Congress of Berlin in 1878. Benn also used history by comparing the use of air strikes against ISIS to the actions of the International Brigade during the Spanish Civil War. This similarity, however, is a minor one in comparison with the certainty exuded by both men when it was their turn to tread the boards. Much in the same way that Chamberlain felt he could trust Hitler, Benn feels that, although he is not sure on the number, the 70,000 ground troops who we are now supporting are of a ‘moderate’ disposition. This is complete and utter foolishness on the part of the Shadow Foreign Secretary. Does Benn actually believe that these groups are pro-democracy fighters and are not al-Qaeda affiliates? Does he seriously believe that by attempting to defeat one group of fascists we are not helping others, the sorts of people who flew planes into the World Trade Centre and blew themselves up on London’s public transport? 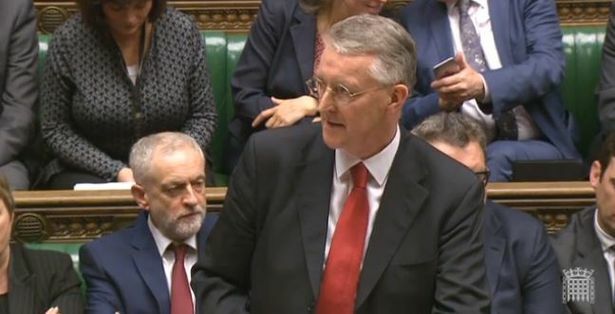 Benn failed to acknowledge the aforementioned possibilities when he rose up to the despatch box, such was his certainty that supporting air strikes was the right thing to do. If he truly believes that air strikes will help defeat the cancer of Jihad, which extends far beyond Syria’s borders, and not help other forms of it, al-Qaeda affiliates for instance, then he can take comfort in the fact that his folly will not be ridiculed by acts of paper waving.